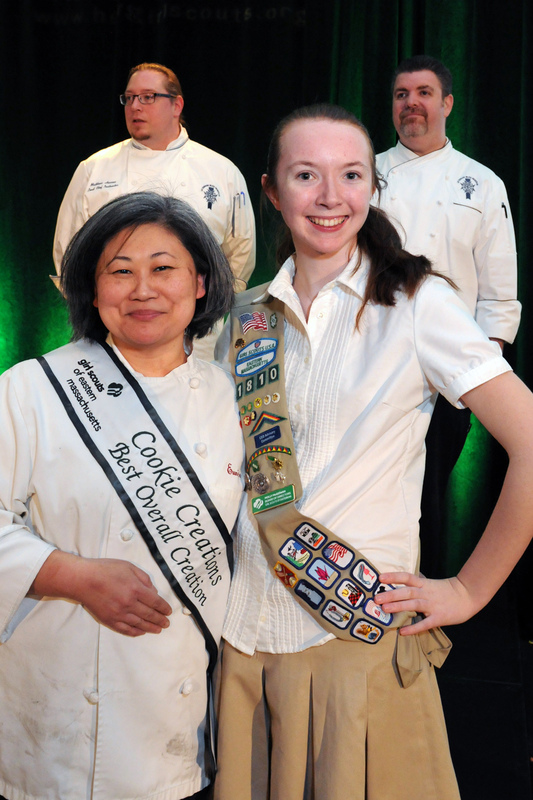 Girl Scouts of Eastern Massachusetts’ Cookie Creations contest featuring local chefs took place last night at the Royal Sonesta Hotel in Cambridge. Each chef was challenged to create a unique dessert or appetizer using Girl Scout cookies as a key ingredient. Guests had the opportunity to taste each creation and vote for “Crowd Favorite.” Guest judges Maggie Battista, founder, Eat Boutique; Matt Herron, lead chef instructor, Le Cordon Bleu College of Culinary Arts; and Earle M. Test, director of education & executive chef, Le Cordon Bleu College of Culinary Arts chose “Best Overall Creation.” This adult fundraiser supporting leadership programs for Girl Scouts also featured a silent auction. Other chefs who competed last night were Susan Abbott, executive pastry chef, The Catered Affair; Danny Angelopolus, Henrietta’s Table, The Charles Hotel, Harvard Sq. ; Danielle Buxton, general manager, A Day to Remember, LLC; Brian Dandro, executive chef, The Royal Sonesta Hotel; Monica Glass, pastry chef,Clio & Uni Sashimi Bar; Donald Hernstrom, head chef and ice cream creator, J.P. Licks; Katie Kimble, pastry chef, Area Four; Lauren Kroesser, executive pastry chef, Eastern Standard; Christina Mercado, restaurant manager & pastry chef, Finale, Harvard Sq. ; Brian Mercury, executive pastry chef, Harvest; and chefs from Kings Bowl America and Shake Shack. Girl Scout cookies, on sale now through March 4, are $4 a package; gluten free are $5 a pouch. To find out where to buy cookies in your area visit www.hergirlscouts.org, click on the “cookie locator” and enter your zip code. Special thanks to event sponsor Yelp Boston.